Zen Shiatsu is a Japanese form of bodywork based on the five element theory of Traditional Chinese Medicine. It is extremely gentle and results in a very, deep state of relaxation that enables the body’s own healing powers to circulate. I use thumbs, fingers, palms, elbows, feet and knees to apply pressure along meridian pathways while focusing on the body’s response to the treatment, helping to cultivating a greater sense of presence and consciousness towards the healing process. Zen Shiatsu will help your body to bring harmony to the meridian pathways and open the flow of energy. Shiatsu can help in a wide range of conditions – from specific injuries to more general symptoms of poor health. Shiatsu is a deeply relaxing experience and regular treatments help to prevent the build up of stress in our daily lives and help us to be in the flow of the Tao by opening the flow of our own qi (energy). Contact me at sonja@sonjadenelzen.com to book an appointment, I look forward to speaking with you in person. $95 for 60 min of stress relieving bliss ~ at our clinic in Gravenhurst or at Urban Wellness in Toronto on Mondays and Tuesdays. https://www.urban-wellness.ca/contact-us/ to book at Urban Wellness – Sonja will also be available here for Acupuncture Treatments. Or schedule 2-60 min treatments at the same location and day, scheduled one after the other, if you would like to treat a friend,co-worker, or significant other and contact me about a special rate for this. Contact me at sonja@sonjadenelzen.com about scheduling. 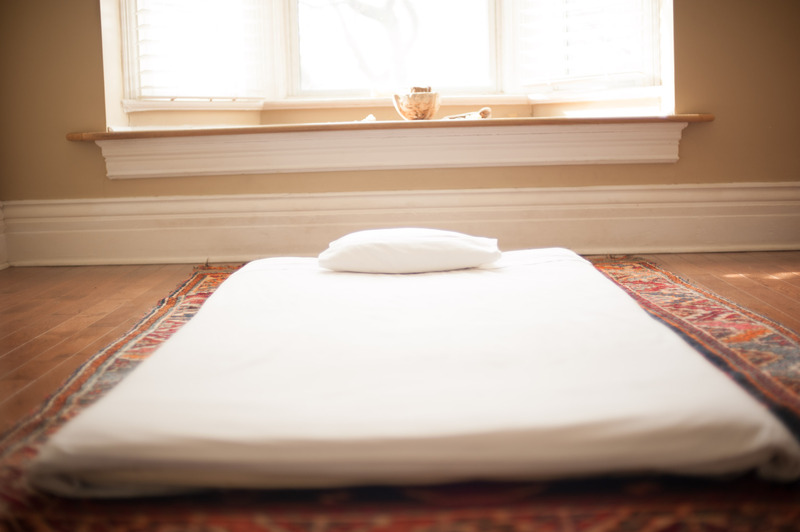 Zen Shiatsu is ideally performed while you lie on a futon on the floor, allowing me to access from all sides and the ability to apply pressure using body weight. You should be dressed comfortably by wearing light clothing. No massage oils or lotions are used or needed because I do not slide along the body surface, but gives a series of presses along the meridian pathways. In 2011 I became a certified and registered Zen Shiatsu Practitioner in Toronto after studying with my teachers, Master Zen Shiatsu teacher Adarsa Chakra and Zen Shiatsu / Macrobiotic teacher Era Birfer. I found zen shiatsu and the training to be a healing and transformative part of my life. The five element theory of Traditional Chinese Medicine, was the beginning steps of a connective link to self empowerment of well being. As well as opening the door wide from just being an observer of the beauty of nature to actually being a participant and beginning to understand the abundance that nature has to offer and our role within the balance of the ecosphere and being in the flow. In 2015 I started the study of acupuncture and Traditional Chinese Medicine, and graduated 2018. The understanding of these teachings have contributed to a deeper understanding of the body and how to use TCM to deepen my shiatsu treatments.